This is Kenny’s newest absolute favorite soup, and I can have it on the table in 30 minutes. I should have double the recipe, as Kenny ate six bowls yesterday! The flavors blend and make the soup even better the next day (if someone doesn’t eat it all the first day). Hope you enjoy this as much as we do. In a Dutch oven over medium-low heat, cook the sausage, potatoes and onions in oil for 5 minutes or until sausage is heated through, stirring occasionally. Add kale; cover and cook for 2-3 minutes or until kale is wilted. Add garlic; cook 1 minute longer. Add the remaining ingredients, bring to a boil. 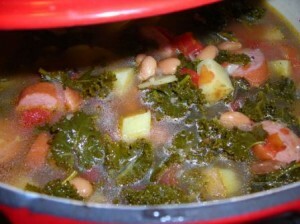 Reduce heat; cover and simmer for 9-12 minutes or until potatoes are tender. Serve with a dusting of fresh Parmesan cheese and a slice of nice crusty bread. * I will only use ½ pound of sausage next time, it does bring a lot of flavor to the soup but a little too much for my preference. 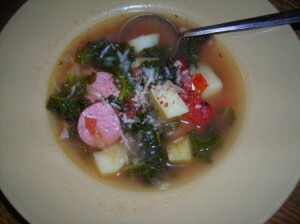 It would also be good without the sausage and replace the chicken broth with veggie broth for a great vegetarian soup. ** I used a quart of our home canned tomatoes and alimented the cup of water (the water is need to add a little more juiciness to the soup). ***I found these Mayocoba beans at the store a few months ago and fell in love with them. They have a great hearty taste and are much firmer than Great Northern beans, you could also use a white cannellini beans.